I have though about sharing this tip about "Printer Connector" a long time. I've got some emails from those wondering how it could be done after Shaan Hurley, Autodesk posted about a solution I made a few years ago at the company I work for. Now I got reminded again reading about Internal Facilities Management application by Scott Sheppard, Autodesk. I assisted Brian Mathews and Brian Pene at their class at Autodesk University 2005 in Florida and I really recommend you to take a look at the available class materials you can find on Scott's blog. Actually Brian was one of those wondering how I had solved installing the printers from a DWF hyperlink. Nice to see that it's used at Autodesk too. Now to the solution that is really simple but useful. 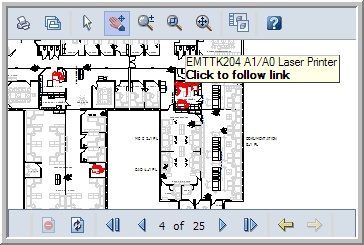 Start with a DWG drawing of the facility and add a block that represents a printer or plotter. Add a hyperlink on the block that links to a html file on a location available for all users. Use the name of the printer and maybe size and type as description. The content of the html file is here. Just change the server name and the printer name in the code. Now Plot or Publish the drawing to DWF. If you have several levels and buildings you can create a main html page that links to these DWF files. The DWF files can also be embedded into a html page and add some simple instructions that they should click on a printer etc. msg="Do you want " & PrinterPath & " to be Default printer?" See this html code or check in the DWF Viewer Help. if not IsObject(CreateObject("AdView.AdViewer")) then msgbox "You need the DWF Viewer!" & vbNewLine & vbNewLine & "Please contact the IT department." ; If multipage DWF's are used navigate to the page named "Level 8"
<a title="Flash the printers" href="vbscript:ShowPrinters">printer</a> you want to have installed. I recommend that you activate usage of single click to follow hyperlinks or include instructions to hold down CTRL + Click. I hope you get the idea. Feel free to use it, have fun and impress on your management and users and IT. Feel free to contact me if you got any questions or post a comment. But did not work. Do I merge both files you show in the example or just the first file? To create the html file you can use Notepad. That is probable the reason. I'm trying to install a printer using this method, but it is not working for me. The script runs great, but it does not actually install the printer. Do any special permissions need to be set? Try to create a VBS file and run it and see if it works. If this works then it is something with the permissions on the HTML/web that needs to be resolved. I was able to create a Facilities utility that installs printers, locate people etc. We have different locations in North, South and Central America, I’m wondering if it’s possible to add a real live clock that indicates the local time to a dwf file. We have a multy page DWF, one page per location that contains layout with people printer etc. I would like embed add a real live clock to each location that would indicate there local time. I could add the clocks hyperlink’s but it would be much better if it was embedded within the DWF. Armando, I have no idea how to embed something like a live clock in a DWF. I doubt it is possible. How did you insert hyperlink to the dwf file? I really need to know. Please help. What are the parameters _cx & _cy that you supplied?? The hyperlinks are created in AutoCAD in the DWG. As to the parameters I don't know. There is probably some API around to convert DXF files to images otherwise you need to open it in AutoCAD and save/plot as image.